Highlights: Panama City ‘Old Town’, Panama Canal, Causeway, Group Farewell. Today was my last activity of the world tour, from tomorrow I will be slowly making my way back to Australia. Lisa helped organise a tour of Panama City and that meant I had a personal one on one tour with Felix. Starting at 8 am Felix picked me up from the hotel and off we went to the Old or Original Town of Panama City. The Old Town section houses the older homes highlighting all the influences on this grand city including French, Spanish, English and North American. The city Cathedral is different in that the towers are an entirely different style from that main section. The towers also have sea shells in the roof. We also visited the Presidential Office Building but they had security everywhere so I could only see from a distance. Felix pointed out the house with the 38 cats some of who were sunny themselves, all looked healthy. This location also allowed great views of the modern city and the Pacific Oceans with lots of ships lined up to enter the Canal. 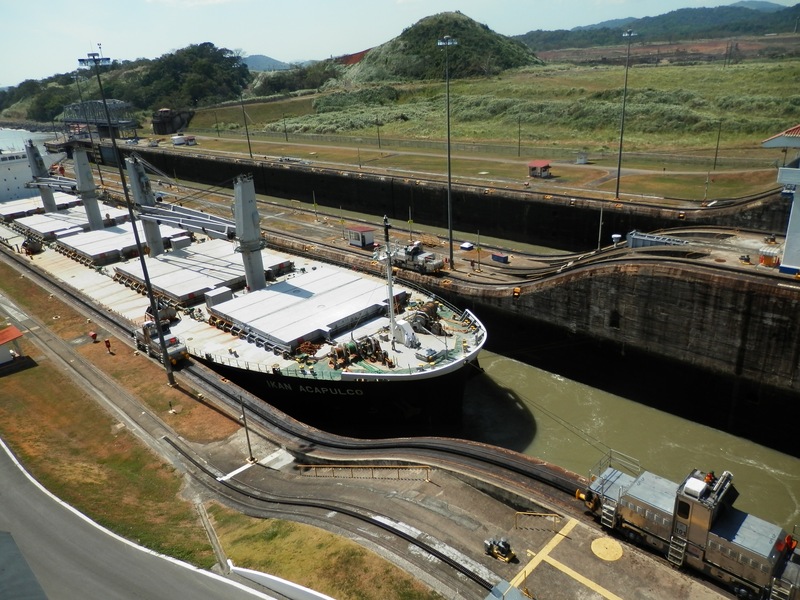 Which led us to the Miraflores Lock which is the entrance point for ships entering the Canal from the Pacific. From midnight to midday ships enter from this side and for the other 12 hours enter from the Caribbean side. I was lucky enough to experience two major ships and one small passenger ship enter the Lock system. For the larger ships they have train engines to help pull the ships though without hitting the walls. I got to watch a short 3D video of the history and future of the Canal. The Canal is undergoing a major expansion. Interesting the entire country got to vote on this change. This is interesting because from the 1960s to 1989 they lied under a military regime and now they vote on major matters like this. Felix informed me that now Presidents are only allowed one five year term. The USA turned over the Canal to Panama control at noon on 31 December 1999 and since that time Panama has turned this into a very profitable venture which is now helping the country grow and expand. The city itself shows lots of construction and activity. This was really obvious when we moved on the Causeway and I could see the multiple yachts and the expanded shoreline with new skyscrapers. Today I caught up with my group one final time. Before we went out to dinner I had a lengthy chat with Robin and James, I consider myself so lucky to have travelled with them for the last 58 days. During dinner a straight after I said goodbye individually to most of the group. Normally I’m the last one to leave not the first one, it can be a sad occasion :(. Finally I got one last chance to chat with our excellent CEO Lisa, but more than that I believe Lisa to an outstanding individual, I really wish her a great future. Tomorrow I have an airport transfer booked for 6.30 am to the airport and my flight back to Dallas.